What makes this class so enjoyable is the ease and simplicity of the project. Beginner friendly (using only straight and zigzag stitching features of a sewing machine). Students will learn basic piecing and simple fusible applique techniques. 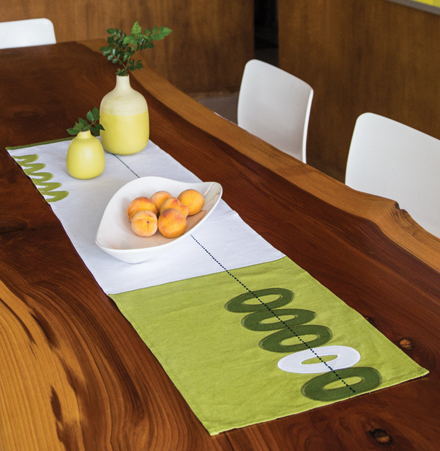 Students will take home an elegant table runner with a modern – “Urban Scandinavian” aesthetic. 3 hours: for the piecing, fusing & machine stitching. 4 hours: if you include the hand embroidered running stitch detail. Can be extended to a two - 3 hour session class to include the coordinating Bread Warmer Tea Towel project (pages 30 – 33). -Optional: fabric for the coordinating tea towel (if offering a two session course – see page 30 for yardage requirements). -Optional (if offering a two session course): additional lightweight (paper backed) double-sided fusible web (1/4 yard) for tea towel. This is great class to introduce a variety of fabrics and also encourages a nice selection of notions to build a students toolbox. Refer to pages 36 - 39 for instructions and placement diagram for the table runner. Refer to pages 30 - 33 for instructions for the coordinating tea towel. Refer to tear out page P1 for applique template. Refer to page 109 for basic hand embroidery instructions.